Brett Weiss: Words of Wonder: Sights and sounds (actually, just sights) from Wizard World Texas. Sights and sounds (actually, just sights) from Wizard World Texas. Arthur Suydam, former Heavy Metal artist, signs autographs for admiring fans. Suydam is popular these days for his Marvel Zombies covers. Adam Kubert signing at the Lone Star Comics booth. Who are you? I'm Batman! This married couple is obviously suited to one another. Although DC didn't have a booth on the convention floor, they were represented at the show by their vice president of sales Bob Wayne (on the left) and executive editor Dan Didio (at the podium). See the Green Lanterns watching over the proceedings? They are the same couple that portrayed Wonder Woman and Batman (shown above). Laura Vandervoort, who plays Supergirl in Smallville, was quite the attraction, drawing hundreds of people (mostly males, for some unknown reason) to her autographing. Laura "Supergirl" Vandervoort. Sure, she's kinda cute and all, but I prefer brunette school teachers (especially those who specialize in English and journalism). The great Noel Neill, who played Lois Lane in The Adventures of Superman, the classic TV show starring George Reeves. 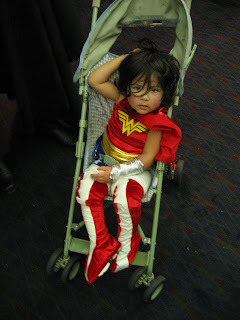 Truly a big Wonder Woman fan.